My brain churned and blended words all day. Around 11:00 a.m., I came up with flexitivity. When things don’t go as planned, and you have to summon inventive solutions, you need flexible creativity … flexitivity. Alas, this word has already been coined (not in the dictionary yet, but in practice in cyberspace), though usually as a blend of flexible + sensitivity. I needed to be more original. My thoughts turned to my brother and sister, who are two of the most inventive people I know. Together, the three of us have been engaged in the Sibling Discovery project for many months now. When we tell people about our monthly conversations and very active, mutual support for one another’s artistry, we sometimes meet incredulous stares. I guess not all siblings engage with each other this way. Perhaps, because our relationship is unique, we need extraordinary vocabulary to describe our interactions. “Sib” and “kin” felt like good building blocks. Again, my mental wheels went whirring. When we collaborate, do we sibsidize one another’s ideas? Sure. Could you say our experiences are kinterwoven? Absolutely. Is our family siblime? Well, let’s not get carried away. My scratch paper is covered with words like these. 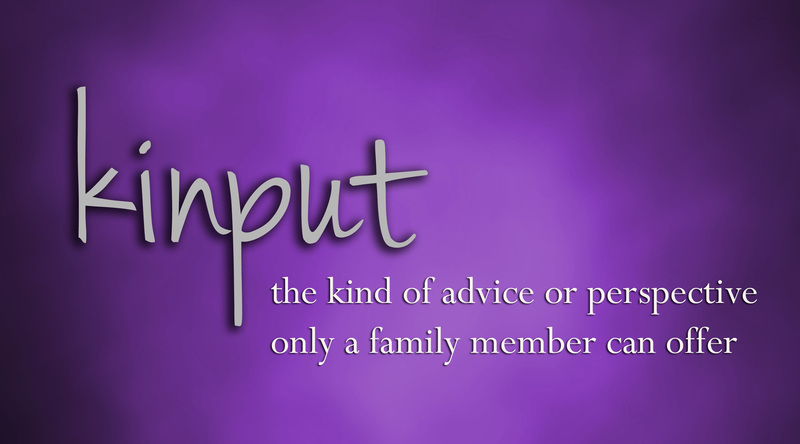 But ultimately, I landed on kinput, which describes the valuable perspective and advice I get from Paul and Norma. However, it’s a neutral word, applicable even to cantankerous families where kinput is not necessarily welcome or useful. What do you think? How does your family exchange kinput?